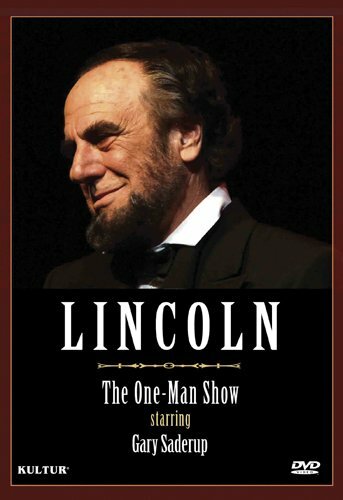 New York, NY (October 4, 2012) - Kultur is proud to announce the DVD release of Lincoln: The One Man Show starring Gary Saderup available on November 27, 2012. Actor Gary Saderup becomes Abraham Lincoln, as he encapsulates Lincoln's entire life, from his early "folksy" frontier humor to the eloquence of word so well remembered from his Presidential years. He reveals how Lincoln formed his attitude towards life and politics, slavery and war, peace and reconciliation. This acclaimed one-man show takes us from Lincoln's years as a prairie lawyer, to the steps leading up to the Civil War and throughout the war years. Gary Saderup shows us why Lincoln is the president still revered most by a majority of Americans today. We see and hear his Lincoln-Douglas debates; his Emancipation Proclamation; his Gettysburg Address, as well as events in his personal life with Mary Todd and his courageous determination to preserve the Union. Gary Saderup is magnificent as Lincoln and delivers a memorable performance that brings Lincoln back to life in a way like never before. This unique program features a dramatic interplay of Civil War era photos, music and graphics to accompany Saderup's unforgettable on-screen portrayal of Lincoln. Saderup, Directed by Judi Stewart, brings all of his experience to the character of Abraham Lincoln as conceived by author Steven Rivera in his epic screenplay Lincoln: The One Man Show. Saderup has appeared on the Shakespearean stage as Macbeth, Othello and Richard the third. He has played many historical characters including John Barrymore and Charles Darwin with actor Patrick Warburton In the hit British play Darwin in Malibu. He has worked with American author Ray Bradbury to create leading roles in two original plays. Recently He portrayed Douglas MacArthur on film in Douglas MacArthur Return to Corregidor.